Our new 7-night cycling holiday takes you through the stunning wild countryside of the Galway and Mayo regions in western Ireland, where high mountains plunge into clear blue loughs and the British Isle's only true fjord. Along the way, pass sparkling running rivers and the famous Irish bogs, whilst on the coast, the crisp blue Atlantic breaks on white sandy undeveloped beaches. This is a rural, idyllic land, where not much has changed over the centuries. Tiny hamlets scatter the way, with a warm welcome afforded anywhere you stop. Connemara, or 'Inlets of the Sea', is a stunning peninsula with a haunting natural beauty. The wild and remote landscapes have captured the imagination of artists for centuries; transforming throughout the day according to the changes in light. Marvel at the abundance of sandy beaches, rusty bogs, shimmering black lakes and wild mountains, interspersed with quaint towns and villages. The wonderful mountain scenery in Connemara marches on into the south of County Mayo and everywhere you walk or cycle is laced by stone walls. Food is fast becoming an attraction in the area, where rich local produce can be relied upon. The seafood is delicious; try the wonderful large mussels and river-caught trout and salmon; as is the exquisite lamb. Of course, Guinness is everywhere, but local craft beers, gins and whiskies are also becoming increasingly popular. We stay in a nice mix of hotels, including a fjord-side spa hotel and a former grand fishing lodge and two friendly B&Bs, one run by a celebrity chef, all offering the traditional Irish welcome and hospitality. Your host will collect you from Ballina train station and transfer you to your accommodation where you will be greeted with a cead mele failte, a cup of tea and some homemade treats from Marjorie's kitchen. Your host will discuss the week's itinerary and prepare the bikes so you are ready for the fun week of adventure that lies ahead. It's just a two-minute stroll to the local pub for dinner and a pint of Guinness where you can also enjoy some live music and soak up the atmosphere with the locals. Wake up your taste buds with Marjorieâ€™s delicious wholesome breakfast whilst overlooking the River Moy and Belleek Woods. From the hotel, follow the path along the famous River Moy and watch the salmon jump before stopping off at Belleek castle for a tour of the castle and dungeons. Itâ€™s then a short cycle to follow the Lough Conn route to Castlebar. Here you will pass by the famous fishing lakes of Lough Conn and Lough Cullin and enjoy spectacular views of the Nephin mountain range. Arriving into Castlebar, you will have time to take a short detour to visit the Turlough National Country Life Museum and discover the history of Irish culture and traditions. After settling into your accommodation, explore the streets of Castlebar and choose from one of the many renowned restaurants for dinner. Leaving Castlebar, it's into country roads along the unspoilt spectacular winding valleys of the natural heritage region on Glenhest, where you will pass by the picturesque Beltra Lough. You will then arrive in the lovely town of Newport, which is rich in history and culture and is also the perfect place to stop off for a coffee and homemade treat in Kelly's Cafe. From Newport you will follow the greenway for 11km into colourful Westport town, enjoying idyllic views of Clew Bay and the Irish countryside (the greenway is a 45km designated cycle route that continues from Westport to Achill Island; up until 1937 it was a train line). This afternoon you could choose from a variety of activities or cultural visits such as visiting Westport House, kayaking around Clew Bay and its 365 islands or taking a tour of one of the local breweries. In the evening, you can wander around the bustling streets and enjoy live traditional music in one of the many pubs. There is no shortage of restaurants to choose from, whether you want tasty local pub food, vegan food or to treat yourself to an upmarket specialised gourmet menu. Heading out of Westport you soon find yourselves on quiet country roads passing wonderful countryside. Green meadows soon turn to bogs as Croagh Patrick, the holy mountain, looms overhead. Pass the tiny hamlet of Liscarney, and fields of sheep. Cross the Owenmore River at aptly titled Owenmore Bridge, before cycling the stunning Tawnyard Lough and through Tawnyard Forest. Drop down to Leenane on the Killary Fjord to your hotel. At Leenane, relax in the village, walk along the Western Way, or cycle or take a boat ride along the fjord. From Leenane you take a wonderful quiet road that meanders through the mountains, isolated countryside, passing bogs and loughs. You'll enjoy stunning views of the Big Bens (12 local peaks). Maams village is great stop-off point, a tiny hamlet on Broch river, with just the one pub! Crossing the Failmore River, you descend to Maams Cross, a crossroads that is slightly bigger than the village, before passing the entrance to Mamean (a local pilgrimage path) and arriving at Lough Inagh. Head along a wonderful road along Lough Inagh with views of the Connemara National Park. Cycle back through Leenane then circle the Killary Fjord before picking up the Sky Road to Fin Lough and your hotel. Perhaps enjoy the excellent SPA facilities at the hotel. You continue on the stunning Sky Road, passing the shores of Doo and Glencullen loughs, before a lovely freewheel into Louisburgh on the coast. Then, following the coast road, you'll enjoy great views of Crough Patrick (it's a 4km climb there and back). Returning to Westport for your final night. Leave Westport, or perhaps have a couple of extra nights in the lively town. Expect a warm welcome at this cosy and welcoming B&B, you will be greeted with a cup of tea and homemade treats by Marjorie your host and local celebrity chef. 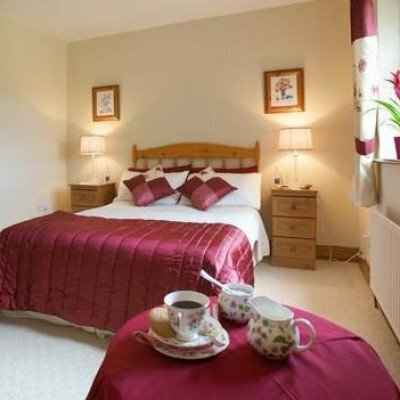 The rooms are tasteful and charming and have tea and coffee making facilities. The b&b has a nice garden and overlooks the River Moy. You will find local pubs and restaurants just a short walk from your accommodation, the next morning enjoying a hot breakfast choosing from the extensive menu. At Carragh House B&B you will receive a lovely warm welcome from Des and Oonagh. 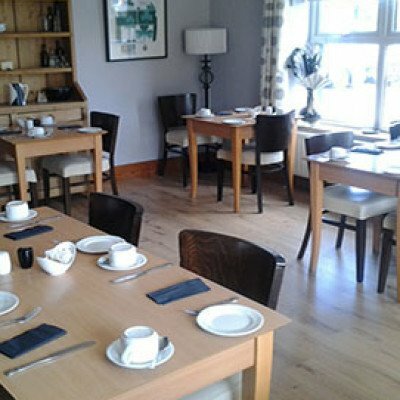 This simple B&B has offers large rroms with all mod cons, including tea and coffee making facilities. There is a drying room on the off chance it has been wet!. The centre of Castlebar with its ample choice of pubs and renowned restaurants is just a short walk from the property, the next morning you will be offered a full Irish breakfast. The Clew Bay Hotel is a beautifully appointed, family-run hotel in the centre of historic Westport. 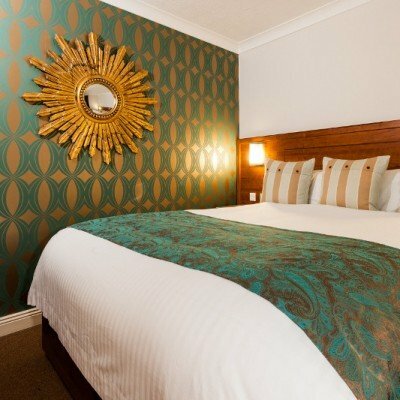 With individually decorated rooms, luxurious bed toppers and amenities including tea and coffee making facilities, TV, hairdryer and free Wi-Fi, the hotel combines genuine Irish hospitality with a great location. Madden's Bistro is a bustling restaurant, open for lunch and dinner and offers a broad menu using fresh local produce and only Irish ingredients. Madden's Bar is a great place to enjoy 'the craic' with traditional live entertainment on weekends, music or live sport on TV. The hotel also offers all guests free access to the Westport Leisure Park next door. Facilities here include a 25m swimming pool, gym, spa with sauna, Jacuzzi and steam room and a plunge pool (towels are available from the hotel reception). 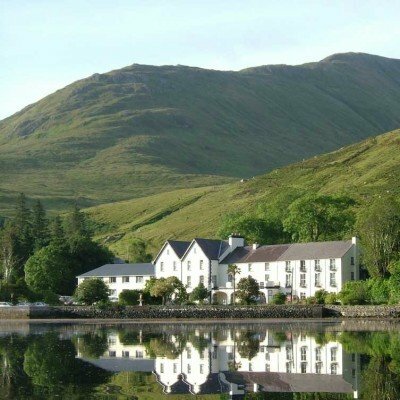 Overlooking Killary Harbour, Ireland's only fjord, the family-run Leenane Hotel enjoys a spectacular, scenic location. Originally established as a coaching inn back in the 1790's, it is now managed by the 3rd generation of family hoteliers, Conor and Brian Foyle, who, along with their friendly team, pride themselves on their warm welcome and the standard of hospitality. The hotel's bedrooms are traditionally decorated with antique furnishings and 50 of the 66 rooms provide views of Killary Harbour, whilst the other 16 have mountain views. The hotel's facilities include a cosy bar overlooking the sea, a private residents' lounge and a spacious restaurant serving good food, including regional specialities such as fresh Killary Bay Salmon and Rack of Connemara Mountain Lamb (served with vegetables from the hotel's kitchen garden). There is a spa offering massages and beauty treatments and beside the hotel are the Connemara Seaweed Baths offering respite to tired and aching muscles. 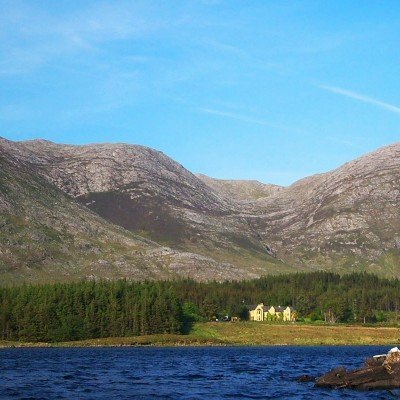 Set in spectacular scenery, on the shores of spectacular Lough Inagh, the Lodge, built in 1880 as a fishing lodge, is surrounded by the majestic Mam Turks and the Twelve Bens mountain ranges. The old-world atmosphere and the comforts of an elegant, modern hotel, including open log fires in the library and oak-panelled bar, provide a perfect combination for relaxation. All 13 rooms, named after famous Irish wordsmiths, are ensuite and decorated with traditional country house elegance and equipped with a comfortable seating area and TV. Wi-Fi and broadband are available in certain areas of the hotel. Guests enjoy simple, country house cooking using locally sourced, seasonal ingredients with seafood and wild game dishes the specialities. Once an adventure centre and hostel, Delphi Resort has evolved over the last 30 years into a **** hotel, an award-winning spa, a contemporary restaurant and a yoga and wellness studio. The luxuriously appointed bedrooms, designed by Laura Ashley, offer very comfortable accommodation with plush pillows, fluffy towels and tea and coffee making facilities. There are no TVs in the rooms, however DVD players are available on request (with a TV to play DVDs only). 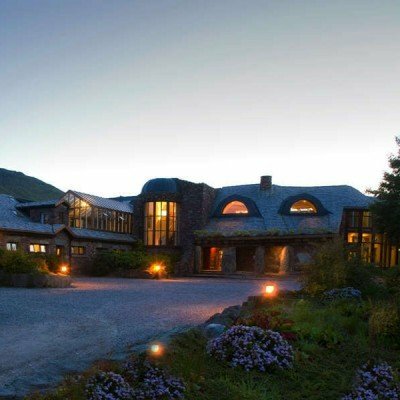 The resort has two restaurants - a gourmet restaurant with scenic mountain views and a cafe offering a laid-back treasure trove of local produce and Irish crafts. The resort, as well as being set in 300 acres of woodland, has an excellent spa facility with a full range of treatments (payable locally) and a Thermal Suite (Jacuzzi, sauna, steam room and relaxation room) that is complimentary for guests to use for the first 60 minutes (payable thereafter). Room upgrades: Deluxe Room, Loft Room or Suite. Every two days from 19th May 2019 to 18th Oct 2019, for 7 nights. All dates are subject to availability, please contact us to check. Transfers are included from Ballina station to the first hotel, and from the last hotel to Westport station.